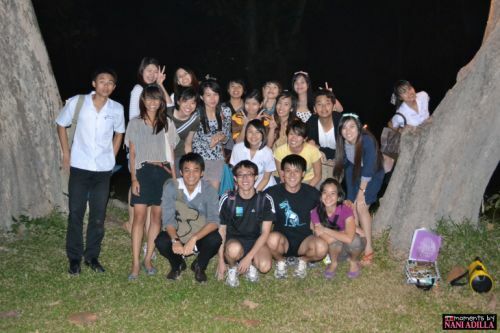 JANUARY 2012: Final year internship in Malaysia. 7 occupational therapy students. During the 7-week long placement, we took a short break and travelled up to Chiang Mai, Thailand. Via our lecturer, we managed to liaise with the occupational therapy staff from Chiang Mai University. Earlier in the day, we were fortunate to have been able to attend a one-day program at the Thai Elephant Conservation Center in Lampang province (45-minute drive from Chiang Mai province). This program was entitled “Thai Elephant-Assisted Therapy: An Innovative Intervention for Individuals with Autism”. 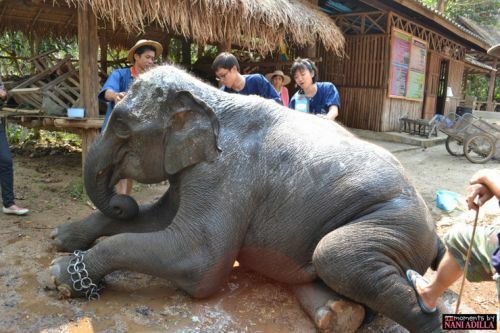 The Thai Elephant-Assisted Therapy Program (TETP) started in 2006 with the goals of alleviating the problems found in children with autism spectrum disorder (ASD), as well as to conserve the Thai elephants. Research into literature has shown that animal-assisted therapy (or pet therapy) has benefits such as increasing balance or providing a calming influence, amongst others. Animals that have been known to provide such therapeutic benefits include horses (hippotherapy) and dogs. Of course in this case, elephants are being introduced – a first of its kind in the world. Only female elephants are being used in the program, with the rationale that these creatures are much more gentle and nurturing than their male counterparts. Also being young, the elephants have a knack for being playful – an asset when working with children with ASD, who on the other hand display difficulties engaging in play. One of the activity elements that struck me was money management. In this segment, participating children were tasked to make a list of things to buy (sugar cane, corn, bananas) and use real money to purchase food for the elephants. Money management is definitely a crucial skill children have difficulty grasping. My favourite part was bathing the elephant. You cannot avoid the beautiful sensory experiences – tactile, smell, sight, proprioception. Using a soap made of leaves, we had to scrub the elephant clean. The material of the soap facilitated the creation of bubbles, definitely an enjoyable experience for children drawn to such. Having a sequence of steps to be undertaken was particularly useful practice for children with difficulties in motor planning. Other forms of interaction with the elephants involved playing games such as ball catching or rings throwing. The purpose of this is to allow children participants to understand following of rules, being a part of a team and experiencing winning or losing. We also got a chance to learn a Thai sing-along dance and have the elephants imitate actions to the lyrics. Through such 2-way interaction, children with ASD can open up to communicating with animals that may be a less daunting task, facilitating eye contact and social skills. Have you ever seen elephants? Have ears, have eyes, long tail. Riding the elephants was a highlight of the program. 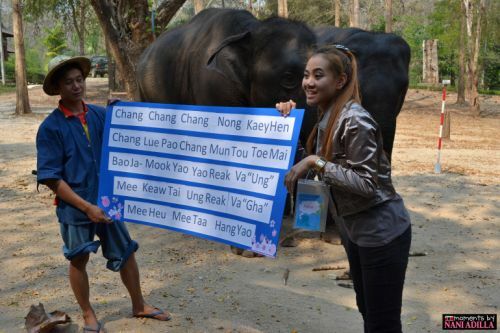 Prior to riding, participants were required to familiarize with speaking commands in Thai. Gait-wise of the animal, research into hippotherapy’s physical benefits are much more established. It was pretty scary to have the elephants walk downhill and uphill much akin to riding those bull-rides. But there was no doubt as to how steady and stable they were, with the elephant’s huge strides along the sandy floors. I personally feel that this is indeed a worthy venture. Not only is the Thai OT community exploring innovative means for treatment of ASD (as the program name suggests), but the underlying practice holds close to the very hearts of the Thai people. Elephants have long been a part of the Thai culture, and such a program ensures the importance of Elephants who may otherwise be dispensable in light of modern-day machinery. At the same time, it provides the Mahouts with a sustainable income on top of relying on tourism alone. Definitely a worthwhile experience for therapists and animal-lovers out there. This program is available free for Thai children with ASD, with different frequency and duration of treatment. Studies have been conducted to determine the effectiveness of the program on this clientele population. For details of these studies, you can contact Associate Professor Dr Nuntanee Satiansukpong (Department of Occupational Therapy, Faculty of Associated Medical Sciences, Chiang Mai University).